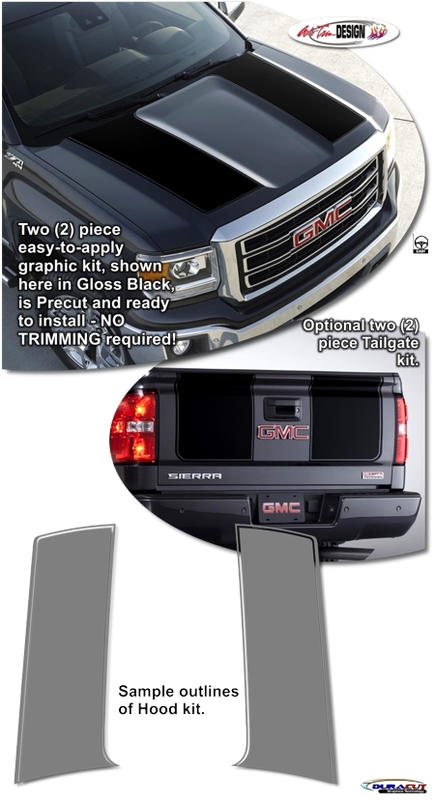 Make your '14-Current GMC Sierra 1500 "Tough-looking" with this Rally Stripe Graphic kit. This easy-to-install kit is packaged as a set of two (2) pieces with a classic pinstripe at the outside perimeter as shown. They're PRECUT and ready to install in a wide variety of colors - NO TRIMMING required! This stripe package is not just a set of straight 17" (43.18cm) strips in a box. Our graphic kit consists of prefitted and contoured pieces as shown in the illustration. This kit is specifically made for the '14-Current GMC Sierra 1500 factory hood and will not fit any other vehicle. Rally stripe pieces are designed for application on the Sierra's distinct upper flat areas. Includes easy-to-follow general online instructions. Optional Tailgate Stripe kit available separately. Due to structural rib supports on the top of certain models of Sierra's roof area, we currently do not offer Roof pieces.